Musings of a Bookish Kitty: Play Time! 1. If we had no winter, spring would not be quite the same. 2. Books can offer a perpetual astonishment. 3. If I had my life to live over, I would do it just about the same way all over again. 4. I love you every second inside of four and twenty hours. 5. If you've never been thrilled you probably do not know the joys of reading a terrific book. 7. And as for the weekend, Saturday included lots of babying of a sick puppy (even at nearly 10 years old, he's my pup) after another visit to the veterinarian; tonight I'm looking forward to cuddling on the couch with hubby and Riley to watch a movie; and Sunday, I want to spend the day reading, catching up with my review writing, and spoiling my cats and dog! My plans to catch up with my blog visits has fallen by the wayside since Riley has been under the weather, not to mention work has been extremely busy these days. I apologize for not being around more. I truly appreciate all of you who have stopped by and visited Musings of a Bookish Kitty. I thought I would share a few (not so good) photos of Riley when he was feeling better. Riley taking a break while playing fetch. My Riley and my parents' Sammy playing ball. "I'm ready. Go ahead and throw me my ball!" Awww, poor Riley. I hope he gets well soon! He's so cute. I hope he feels better soon and quits worrying his mama. What a sweet little baby! It breaks my heart when the little furries don't feel well. I will pray for a speedy recovery for him. We will be here waiting for you when you get back to business! Riley looks so sweet! It's so hard when our babies aren't feeling well. Hope he's better really soon. Riley is adorable and I hope he gets better soon. I know about life getting in the way of blogging, but what would we blog about otherwise;-) That's the great thing about bloggers. They stick with us through everything. I hope you have a great weekend! Awww what a sweetie. What type of dog is Riley? He looks like a kind if terrier mix. Hope he feels good soon. I didnt get to my Friday fill in this week. I have just been so busy Fri and Sat. Poor Riley. :( I hope he perks up soon. He's a total cutie. Sandy - Thank you, Sandy. I worry so much when their sick. Probably more than I need to. Ingrid - He really is a sweetheart. :-) He ate a little of his dinner tonight, which is good. I hope I do make time to read tomorrow. I could use a good book! 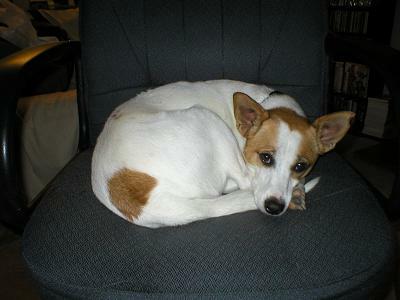 Caspette - He's got a little bit of Basenji and terrier in him along with probably a dozen other things. He's a mutt just like me. :-) And thanks! I'm hoping he'll be feeling better soon as well. Memory - I sure hope so, Memory! It's hard seeing him so down. He's usually the life of the house. Kelly - Hard winters certainly do make the pleasure of spring much more worth it! I'm so sorry to hear that Riley's not doing well, Wendy - I hope he's better soon! Glad you can spend some time with him this weekend. I hope you/hubby/and the fur babies have a wonderful Sunday!! I hope Riley is feeling better Wendy! What did the vet day? My thoughts and prayers are with you and Riley. Florinda - Thanks, Florinda. I think the antibiotics have kicked in and are finally working. We'll see how he holds up the rest of the weekend. He's had a rough week. Teddy - I hope he'll be back to his normal self soon. The vet gave him a prescription for an antibiotic and then something for the pain. Hopefully it will clear things up. I hope Riley gets well soon, Wendy! I love his pics. We've had three dogs over the years and the last one, Annie, was sick for quite a while so I know how time-consuming and worrying it can be. She had some kind of disease where she was allergic to herself and was always in rejection. She ended up taking a human medicine that organ trnsplant patients have to take so they don't reject their new organs. And after all that she lived to 15! I hope Riley is on the mend. When Max was really sick a year or so ago I was a basket case! I will say that the first antibiotic didn't work as well as I'd hoped and had the vet give him a different one after a week and the new antobiotic had him up to his old tricks within days. Get well, Riley! Alice - Thanks, Alice. He's feeling a little better today. Enough so that hubby and I could leave him for a little while on his own. Linda - I probably worry way too much, but I just hate seeing my animals suffer. I can't imagine being allergic to myself! I am glad your Annie managed so well despite that. That's a great story. Thank you so much for sharing. Stacy - So far so good with Riley. Thanks! It's so hard when they are sick, isn't it? We want to comfort them and ease their pain and yet we feel so helpless. I am glad everything worked out for Max! I'm sorry to hear that Riley hasn't been well. We love our furkids so much it's hard to see them suffer. I hope he feels better very soon! I hope that Riley gets to feeling better soon--he is such a little cutie! And I agree about the winter/spring sentiment--really makes spring that much more special (although we barely have 4 seasons here in Dallas). Nat - They're such a big part of the family. I think Riley is rivaling me this morning in who is most sleepy and doesn't want to get out of bed. Trish - Thanks, Trish. The seasons where I live aren't very pronounced either. I agree, a book can be thrilling! Riley's so cute! I hope he's getting better now. Such a cutie! Sorry he's sick. :( My husband's cousin and his wife are staying with us for awhile with their two dogs (no, the kitty is NOT happy) and Maggie hasn't been feeling very well lately either. Iliana - I love spoiling my furkids. :-) There getting spoiled this weekend too. Merri - Thank you. Riley seems to be doing much better. He was chasing the cats earlier today, which is always a good sign. Good luck with the library challenge! Jen - I know those cats can't be happy! Whenever we visit my in-laws and take Riley with us, their cats would hide for much of the visit. I do hope Maggie is feeling better! It's so hard when they are sick.